Unlike the first computer versions, this game originated on consoles and focuses on the action on the field instead of detailed strategy. There is still a detailed range of moves available, all grouped for quick selection. Game play modes include regular season, playoffs and sudden death. 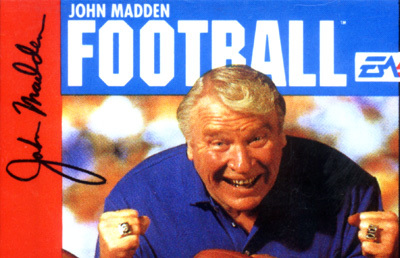 The game features 16 regular teams plus one All-Madden team, each with their own strengths and weaknesses. Play actions include selecting a pass recipient as a play unfolds, block tackles, dives and sackings. Different weather conditions come into play when it's wet, snowy or muddy.